I must have slept well as Rosina told me there was a short thunderstorm during the night but I didn’t hear a thing. This morning we again caught the ferry across to Manhattan whose terminal is just 150yds from our RV. 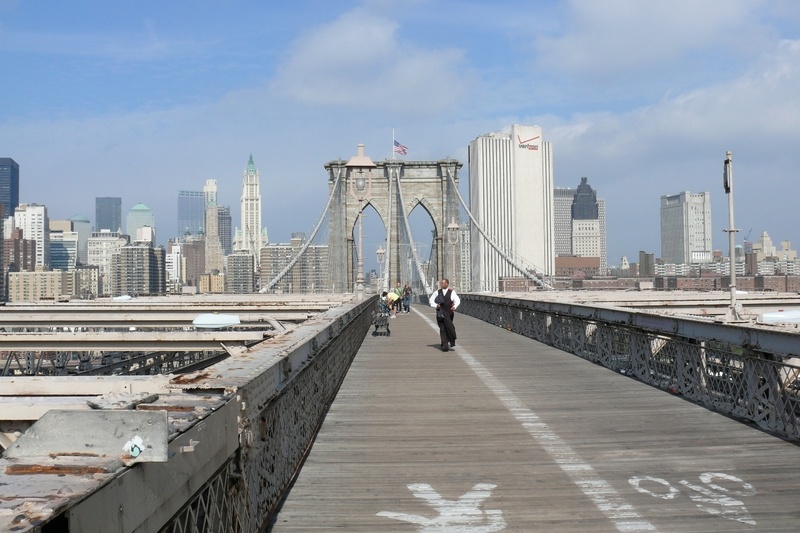 Today we intended to visit the Tenement Museum, the Rockefeller Center and Grand Central Station, but first the Brooklyn Bridge. We enjoyed our walk all the way across it the last time we were here and this time was no different. The weather was bright, sunny and warm which was just right. Sadly the most noticeable difference on this occasion was the absence of the Twin Towers of the World Trade Center on the skyline. Our walk across the bridge completed we set out on foot for the Tenement Museum on the Lower East Side www.tenement.org which was something The Chef was particularly interested in visiting. On arrival at the address there was a notice on the door informing us there were only guided tours, and these could be purchased at the bookshop down the road, so off we went to buy our tickets. 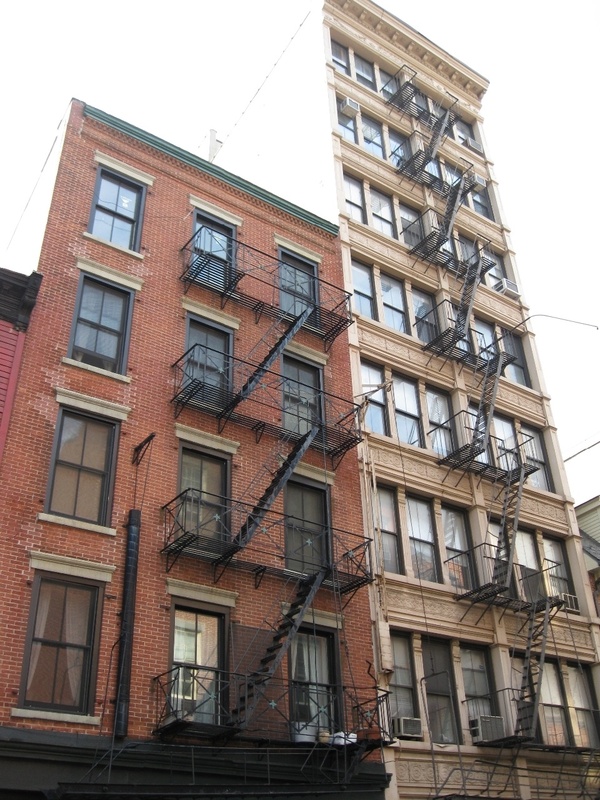 In a small room at the back of the book shop we watched a video about the living conditions of immigrants on the Lower East Side, after which we joined a small group on our 12:30 tour of the Tenement Museum. It was great to visit such a building and get a real feel of what living conditions were once like for so many poor but hopeful people. Our guide showed us two apartments and told us the history of the families which occupied them. This was such an interesting tour and worth the effort to get there. Following the visit we decided to have lunch, and as we were not carrying a packed lunch had to buy American cuisine. It was to be hamburgers, mainly because I didn’t like the look of the member of staff at the pizza joint across the road and wouldn’t have wanted him preparing me anything all. My theory being than anybody in the catering industry that looks like a dishevelled, scruffy slob, probably finds the time to publically scratch his arse, but not the time to wash his hands after a visit to the bathroom. The meal was just fine, and it was a meal as opposed to a snack. With full tummies we found the local subway station and made our way to the Rockefeller Center, another place on The Chef’s wish list. It took a bit of finding but when found, didn’t impress us at all. It seemed to have posh expensive shops on the lower floor and for a rip-off $20 each, a view of the city from their observation tower. We decided this was too much to pay and so moved on, this time to Grand Central Station. We’d been before but as we were almost passing it on our way to the subway station at 42nd Street thought we’d take another look. This is an impressive building with the trains running out from platforms down in the hot, basement-level below. After this we decided to make our way back home, time was getting on and we had chores to do, including the laundry prior to our leaving tomorrow morning. We took the subway to Wall Street for our ferry connection. During our trip back across the Hudson River it started to rain heavily and at journeys end we had to dash from the ferry to the small open sided passenger shelter until it eased enough for us to make a dash to the RV. This evening has been spent doing odd jobs and my chatting to our newly arrived neighbours from Australia who fancy trying Wal-Mart overnight parking in their hired RV but didn’t know the ropes. LOCATION TONIGHT: Liberty Harbour RV Park, 11 Marin Blvd, Jersey City, NY 07302. This morning we were up and on the 09:20 ferry which crossed the Hudson River to Pier 11 on Manhattan Island. By this time the cloudy sky had broken up giving us a lovely warm, sunny morning. Today’s cunning plan was to set out a little later and then stay over there until it was dark to photograph the Times Square area and city skyline. The ferry fare was $6 return and represented good value for money, as well as being fun and a speedy way to cross the river. On arriving at the other side we made for Wall Street, a location we’d missed on our last visit and just a short walk from the jetty. When we arrived there were lots of film crews around, we wondered what the story was as we’re not getting much news these days, the last was a few days ago when the US government was trying to put through a seven-hundred billion dollar rescue package, caused by reckless city spivs trousering staggeringly huge bonuses earned by trading worthless pieces of paper between each other. I asked a security guard what all the excitement was about, he told me that yesterday the Dow Jones Index had dropped about 800 points, its largest drop ever. 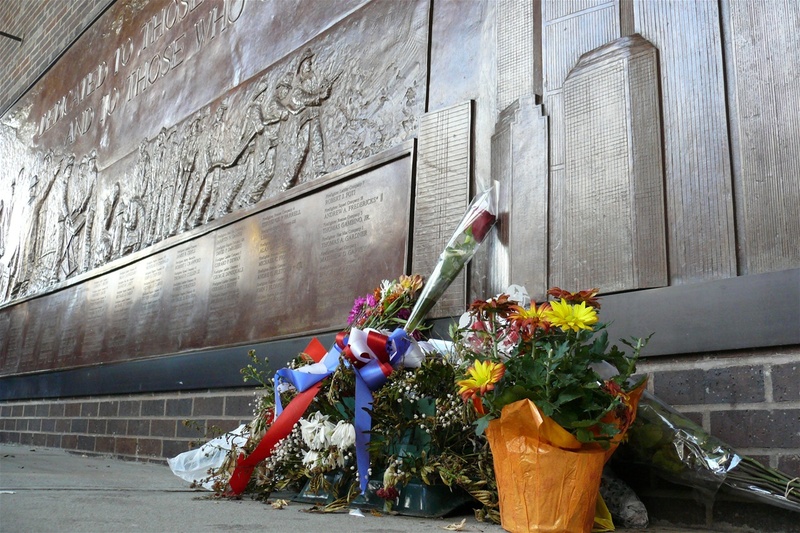 After a few photographs we made our way to Ground Zero, again it wasn’t too far to walk. The most amazing thing at the site is the lack of damage caused to the surrounding buildings when the buildings collapsed, both towers miraculously crashing down almost within their own footprint. They’re now working in earnest to build a replacement structure which is due for completion in 2012. The Fire House across the road had its front doors blown in and lost 5 firefighters. 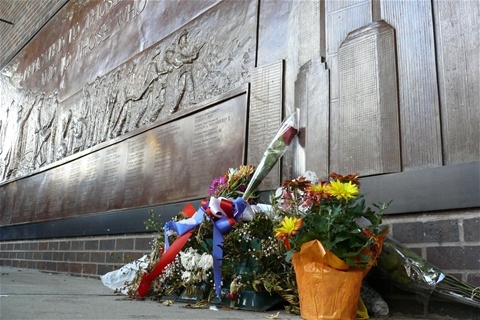 Around the corner is a memorial wall to all the firefighters who lost their lives in the city that day. From here we walked to Battery Park, another missed location from our last visit. 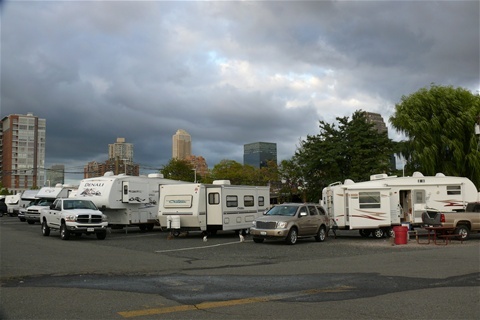 This was a very pleasant spot with good views across to the Statue of Liberty, Ellis Island and the area in which our campground is situated. It is also possible to make a ferry trip across to Liberty State Park from here though the queues were long. It was much busier than the same trip we’d made yesterday setting out from Ellis Island railway station ferry stop across the water. We sat and had our packed lunch watching the world go by, and having dined in style decided to get the subway up to Central Park while the weather was so nice. Once back up in the sunshine near Central Park we realised we hadn’t had a drink with our lunch and so made for a nearby ‘Starbucks’. Having made our purchase and taken a seat Rosina pointed out the back of somebody sat at the counter just a few feet from us, she discretely remarked how much like Renée Zellweger she looked. After a while it was clear to see that it was indeed ‘Bridget Jones’ herself, she appeared to be a private person, busy communicating with text messages and with a pleasant disposition when talking to the staff. It was nice to see that she was going about her business in a normal way rather than doing that dreadful ‘Celebrity’ self-importance nonsense with the shades and minders etc. Local people seemed to like that, and respected her privacy, and we had every intension of doing the same. It was to be some time later that we realised Renée was the first well-known person we had been close to who was still alive! After coffee it was off for a stroll around Central Park, including the ‘Strawberry Fields’ area right across the road from the Dakota building outside of which John Lennon was murdered. After Central Park it was a stroll down to Times Square. Although it was starting to get dark it still had a way to go, but after taking some photographs and video we decided it wasn’t worth hanging around for darkness to come. Rosina’s back still wasn’t 100%, though she’s bravely soldiered on all day. It’s not like we’d never seen it in the dark with all the neon signs before and so made our way ‘home’ via the subway to Wall Street and the fast, powerful ferry from Pier 11. LOCATION TONIGHT: Liberty Harbor RV Park, 11 Marin Blvd, Jersey City, NY 07302.